This year’s survey gave a clear indication of how di­ cult the changing regulatory environment and the banks’ tightened lending policies have been on brokers. The total ratings for the top 10 banks were significantly lower than last year despite the banks, respondents, themes and questions being the same as previous years. While this year’s results reflected a downward shift in mood, the same trends have emerged: the banks that are listening to and working with brokers, who are delivering fast and efficient service and turnaround times, are the ones brokers want to work with. 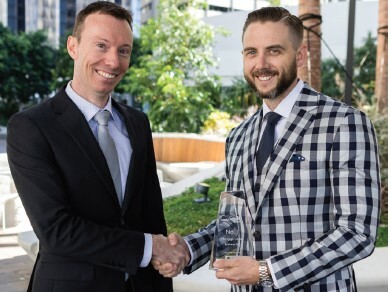 NAB relationship manager Dominic Amor presents the Top 10 Brokerages trophy to winner Matt Cunliffe, the owner-manager of Mortgage Choice Brisbane City. This year’s Top 10 Brokerages report explained how their commitment to superior service, client education and staff­ training and support helped them become stronger in the face of change. Across the board, aggregators fared well in this year’s survey of brokers, gaining positive reviews in a number of surprising areas. The majority of brokers say they’re happy with their fee/commission split; they find their aggregator’s professional development days useful; and they aren’t concerned about any hidden costs. The top aggregators in this report show that their strength lies not in just one field but across the gamut. They know that a successful brokerage relies just as much on a robust compliance and communication system as it does on marketing support and a quality lending panel. They’re becoming a more important partner to their brokers, catering to their growing needs in an evolving market. 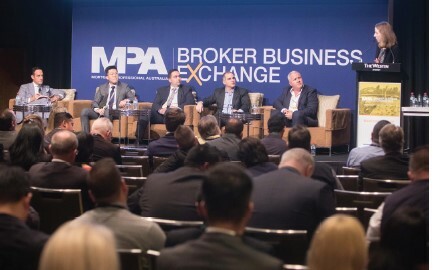 Hundreds of brokers joined MPA in Sydney for the inaugural Broker Business Exchange on 6 June, which featured talks and workshops by various lenders, brokers and industry fi gures. Brokers learned about business strategies and growth; lead generation and referrals; and of course no one could stop talking about the royal commission. The event will return next year with another jam-packed agenda. 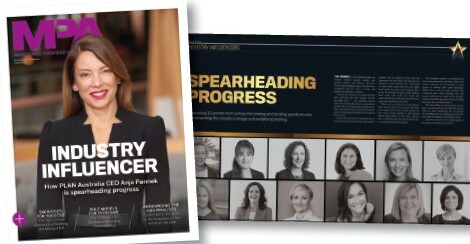 In September, MPA launched its inaugural Women in Broking issue to recognise brokers and leaders spearheading progress in the industry. The magazine featured stories about the challenges women face in juggling workplace pressures and personal expectations; the barriers and perception gaps between men and women; and how women can make their voices heard in a still-male-dominated field. The issue revealed that there are still many problems simmering beneath the surface, but we hope that this is one step in the right direction towards addressing them. This has been a good year for the non-banks. With the banks tightening their lending policies and practices as a result of intense government and public scrutiny, alternative lenders have welcomed an uplift in business. With more flexible lending policies and stronger appetites for near prime, alt-doc, investor and foreign borrowers than the banks, brokers have inevitably been sending more clients their way. If non-banks want to expand their reach and be top of mind with brokers and their clients, they should heed brokers’ suggestions, compliments and complaints. 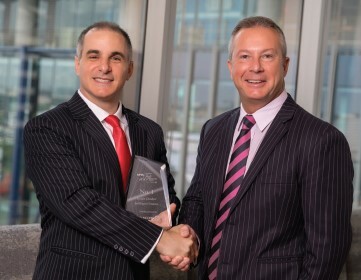 Justin Doobov (left) is presented with the trophy by Mark Vilo, head of bank intermediaries at Suncorp. Doobov settled more than $323m in residential loans in FY2017/18. Across the board, this year’s Top 100 figures dropped, signifying that the cooling property market, increased compliance and the banks’ tighter lending standards are making brokers’ jobs tougher. The 17th Australian Mortgage Awards on 19 October marked the grand finale of the year, showcasing the brokers, lenders and aggregators who have shone the brightest despite the industry tremors. 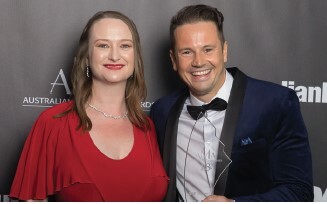 Josh Barlett from Loan Market Bayside was presented with the Westpac award for Australian Broker of the Year by the bank’s NSW/ACT state GM for mortgage distribution, Sarah Willsallen.